VIDEO: Airstrikes Hit ISIS Convoy Fleeing Fallujah : The Two-Way Iraq's Ministry of Defense released dramatic aerial footage apparently showing airstrikes hitting an ISIS convoy on Tuesday. Hundreds of the group's vehicles were reported destroyed in two operations. 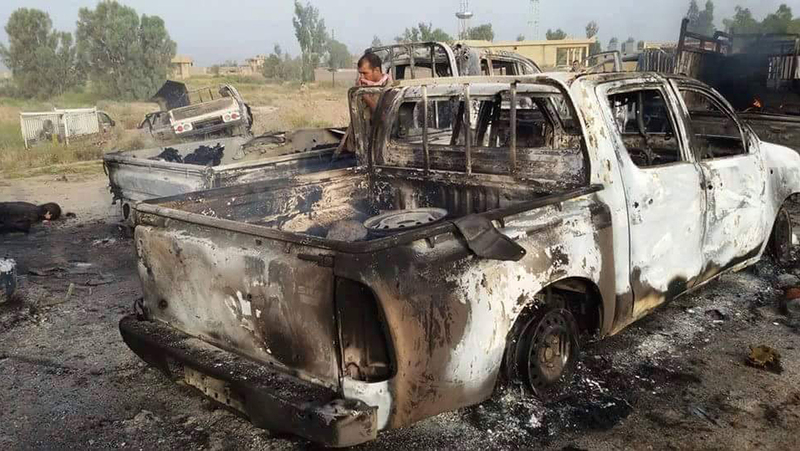 Iraq's Counterterrorism Service released an image showing a destroyed militant vehicle after Coalition and Iraqi security forces targeted Islamic State fighters on Wednesday. The U.S.-led coalition and the Iraqi military say they have hit two ISIS convoys in Iraq, and they say hundreds of the militant group's vehicles were destroyed. As NPR's Alice Fordham tells our Newscast unit, "two large groups of ISIS fighters have been hit this week in the western province of Anbar." Anbar is home to the embattled city of Fallujah, which was under ISIS control for the last two and a half years. Iraqi security forces announced Sunday that they had wrested control of the city from the Islamic State militants after a five-week-long offensive. The first ISIS convoy hit was outside Fallujah. A spokesman for the U.S.-led coalition tells Alice that surveillance and intelligence reports indicated that a group of fighters was gathering southwest of the city. Then, as Col. Chris Garver explains, "When we could positively identify this as a convoy of Da'esh fighters, Iraqi Air Force and Coalition airstrikes attacked the convoy throughout the night and into Wednesday morning." He estimates coalition strikes destroyed 55 of their vehicles. An Iraqi military official said in a video released by the Ministry of Defense that Iraqi forces — including more than 20 helicopters — also destroyed 138 vehicles belonging to the group. The official, identified by The Associated Press as Lt. Gen. Hamid al-Maliki, said no other force took part in the operation. Garver said both coalition planes and the Iraqi military launched airstrikes. The military officials in the video said an unspecified number of ISIS fighters were killed in the assault. "When strikes from both Iraqi and Coalition [planes] hit the convoy, the Da'esh fighters abandoned their vehicles and fled on foot. We estimate Coalition strikes destroyed approximately 120 Da'esh vehicles. Again, we know the Iraqi Security Forces destroyed more." As Alice reports, "The extremists have lost several cities in Anbar in the course of this year – but still hold the large city of Mosul, which Iraqi officials say is their next objective." Fallujah is located just 35 miles from Iraq's capital, as we have reported, and the militant group used it as a launching pad for armed attacks in Baghdad. The recent military offensive in Fallujah has exacerbated a dire humanitarian situation. Last week, the U.N.'s refugee agency estimated that 85,000 people had fled the area since the offensive began in May.